Discussion around the code — is the main part of the code review process. Reviewers look through the code, ask questions, write comments, and also mark defects. The code author, in turn responds to the comments, fixes defects, and bugs. The author can also defend their notion, arguing with reviewers. The conversation subsequently develops into a discussion. A single review can be compared with a mini forum, where review comments are topics on this forum. According to a survey, a single review may contain at the average about 10 comments. Previously, only the first line of a comment was visible in the collapsed view. Comment’s author name is fully visible in the collapsed view. In the previous version only initial letters were displayed. The number of responses is now visible in the comment header. Previously, we used various colors and icons that were obscure to users. Previously a user could change a comment status in two ways. This approach baffled users. Besides UI improvements we have made a significant change in the algorithm of associating comments with code. Previously, while adding a comment the application memorized the file name and the code line. A file revision containing comments was calculated based on the revisions range attached to a review. This caused some problems in case of significant file changes. It was difficult enough for a reviewer to determine, which line of code initially contained a comment. Although we corrected the comment position automatically, there were some cases when it didn’t help. The application memorizes a file revision identifier while adding a comment. While clicking a file name inside a comment, a files comparison opens. 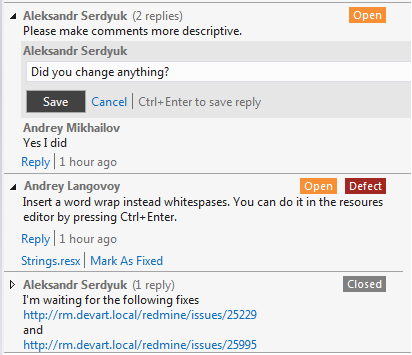 The reviewer can see an old revision with their comments, and modified code in the same window. All changes are highlighted in colors. This allows the reviewer to get the direction to what exactly was changed.